Okwui Okpokwasili’s Poor People’s TV Room is a raw emotional piece that is truly compelling. Two historical incidents in Nigeria drive the artist’s work: The Women’s War of 1929 and the Boko Haram kidnappings of more than 270 girls in 2014. Yolanda Cesta Cursach, Curator of Performance, explains the piece as “erased moments of resistance and collective action”. The physical TV rooms displayed further the parallel times and illustrate the place dedicated to obtaining information. The piece challenges the viewer that this physical TV room also is inside of us, a metaphorical place in which we store our constantly obtained knowledge and what we do with it. This multi-disciplinary project with director, designer and filmmaker Peter Born, is a stunning play upon spatial dimensions and bending the concepts of time. From 1929 and the recent past, these female voices and stories have been suspended in time. With multiple generations of women represented in this work, the piece interprets those voices into an intimate bare all portrayal of pain, power and the relationship to themselves as explored by the relationship between each other. In an industrial like space, plastic wrap walls separate dancers with a gaussian blur. This choice in staging beautifully illustrates the parallels of history and female narrative. Time is further bent with a visible platform and suspended lamps, chairs and TV. From top town cameras, gravity is twisted and reality challenged as the performers interact at a 90 degree angle that is projected right side up on a screen for the audience to watch. 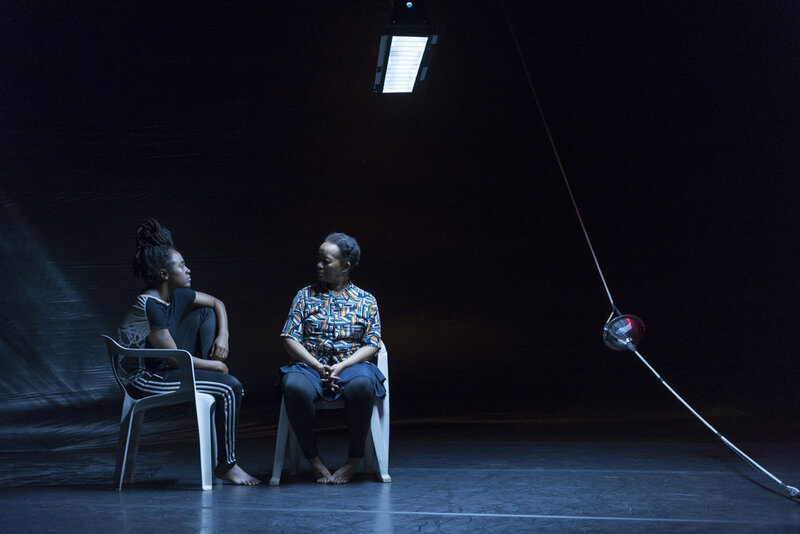 With these intricate stage designs and play with live mediums, it is no wonder that Okpokwaili and Born’s past collaborations have garnered two New York Dance and Performance Bessie Awards. The collaboration is stunning and packed with such detail. For those unfamiliar with these historical events, The Women’s War of 1929 was an insurrection in British Nigeria when thousands of woman from six ethnic groups organized protests against the Warrant Chiefs, whom they accused of restricting the role of women in government. This point in time is considered a strategically executed anti-colonial revolt to redress social, political and economic grievances. And the 2014 incident of more than 270 girls kidnapped from school by Boko Haram, an extremist, Islamic, terrorist organization based in northeastern Nigeria. According to an article in The Washington Post last month, distressingly enough even more girls have been abducted in Dapchi, Nigeria. With these extremely potent social injustices as backdrop, Okpokwaili’s work draws attention to the concept of knowing. The brutal reality of information stemmed from our societal focus on media and politics into an intimate examination of the direct lives it is actually affecting. 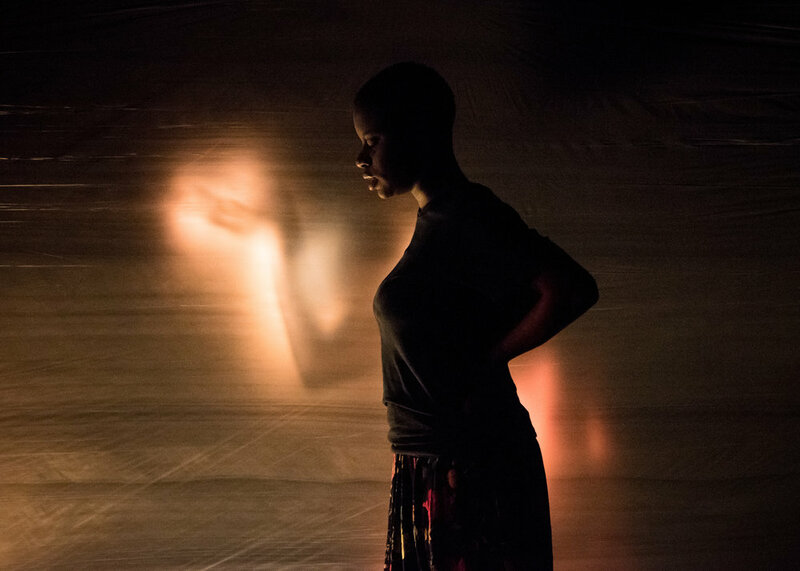 Okpokwasili is a new York-based writer, performer and choreographer. The exploration of the possession of knowledge is evident within this piece. The overwhelming connectedness the modern world has and the vast awareness is intimidating, yet there are still those in the world without a voice or it being hidden among all the other knowledge happening. Katrina Reid and Nehemoyia Young’s duet towards the end of the performance was a painfully beautiful exhibit of paralleled voices. The dynamic between both performers shown through leaning positions and intertwined movements. The choreography bridges modern contemporary and traditional West African motions. Twisting limbs and intricate hand gestures with motion to and from the self evokes an unsettling pain. The weight of each movement is incredibly charged and Okpokwasili’s performance stuns with unabashed eye contact that pierces the soul. The thematic words cow, Oprah, tee-shirts, house girl, and more are repeated over and over with different inflections as the conversations between performers rise and fall in waves of frustration and anguish. Oprah used as an example of a goddess like beacon of hope and comfort. Showering the world with excessive riches turned to advocacy because if Oprah talks about - the rest of the world listens. Advocacy and collective priorities are powerfully examined through language and the choice of repetition. The incomparable Thuli Dumankude gives the first monologue and throughout the piece portrays the complex anger and misunderstanding heart through such intimate movement and hauntingly beautiful voice. There are several moments of song within the work of Dumankude and Okpokwaili leading that are hauntingly beautiful and bring you to the brink of a swelled emotion of silenced voices finally being heard for the first time. Dumankude is a South African-born singer-songwriter and Broadway actress. She is best known for having originated the title role in 1983's Poppie Nongena, for which she received the Laurence Olivier Award for Actress of the Year in a New Play in 1984. Living on the Western Hemisphere, particularly in America, I find our culture severely jaded. Tucked away on a separate continent away and isolated from the direct contact of violence and social injustice. That isn’t to say we do not face our own travesties here in the U.S. with gun violence and a plethora of other social issues. It is more to say that the perpetual civil violence and unrest across the ocean goes unnoticed until the next viral photo or video. Social media plays a huge role in the empathy department for Americans. The relentless blank stare of a young boy covered in dust or another slumped face down on a foreign shoreline or the faces of a large group of young girls dressed in black cover our screens and the heaviness of tragic sadness settles and we grieve and question for a few moments or hours or days until another viral video surfaces. The fleeting existence of social media makes it extremely difficult to hone our priorities as a society with such chaotic distraction. Little or transient empathy is mainly due to the lack of understanding, but the knowledge is still there. We cast aside the violence as nothing new and a world citizen’s sigh of dissatisfaction without much action. So while the world is raging at our doorstep, perhaps instead of just sharing across Facebook how heavy our hearts are – take action. Make those voices heard. Do not allow the silence grow. Donate to a charity aiding those less fortunate or survivors of tragedy. Volunteer your time to organizations working to make a difference in the world. And if you really are unable to do much of anything, you can be an active advocate. Share donation pages, share organization’s pages, utilize the digital beast for the better. Take an active role in social media, not just a passive one. Spread resources, not just empathy. Poor People’s TV Room runs 90 minutes and takes place at 7:30 pm on Thursday-Saturday, April 12-14, with an additional 2 pm show on Sunday, April 15 with ASL interpretation and audio description. Tickets for the performances are $30 and are available at the MCA Box Office at 312.397.4010 or www.mcachicago.org. Okwui Okpokwasili, Poor People’s TV Room. Photo © Mena Burnette of xbmphotography. Okwui Okpokwasili, Poor People’s TV Room. Photo © Ian Douglas. Performance view, Okwui Okpokwasili: Poor People’s TV Room, MCA Chicago April 12 – 15, 2018 Photo: Nathan Keay, © MCA Chicago.